Ike’s first centerline and it most definitely won’t be his last. I am so proud of my boy and how well he handled himself at his first dressage show ever. The day started early – up at 4:15 and at the barn by 5:30 with a large coffee in hand. Finished Ike’s braids, hooked up the trailer, applied a good coat of Show Sheen, and it was time to load. All fingers were crossed that it went without protest. Ike walked right on and we were on our way. We arrived earlier than planned, but I’d built-in some extra time for loading. It was good to have some extra time in the barn area. Every horse in the stable whinnied hello when we arrived and then the cacophony and chaos ensued. Every horse decided that we should provide their breakfast, and when we didn’t there was loud neighing and stall banging. This got Ike worried and soon he was whinnying constantly and rearing in his stall. Made the decision at that point to tack up and get him out of the morning madness. Ms. C arrived as we finished tacking and we headed to warmup. Lots of scary things to see on the show grounds. Bleachers, jump standards, the John Deere tractor grooming the rings. We walked for a good 20-30 minutes and Ike finally settled enough to focus. I was glad to have Ms. C there to calm my nerves and give Ike confidence. I also had a great cheering section with my dear friend T and her family and my husband. What more could we have asked for on this gorgeous spring day. The first test was Intro B – 66.2% and a blue ribbon. (*The win should be asterisked since we were the only entry in the class.) But, we stayed in the ring and got good feedback from Elizabeth Lewis (S). Horses will always surprise you. Centerlines at home have been straight and square. This ride – first halt crooked and then a bit of canter on the final turn of the test. 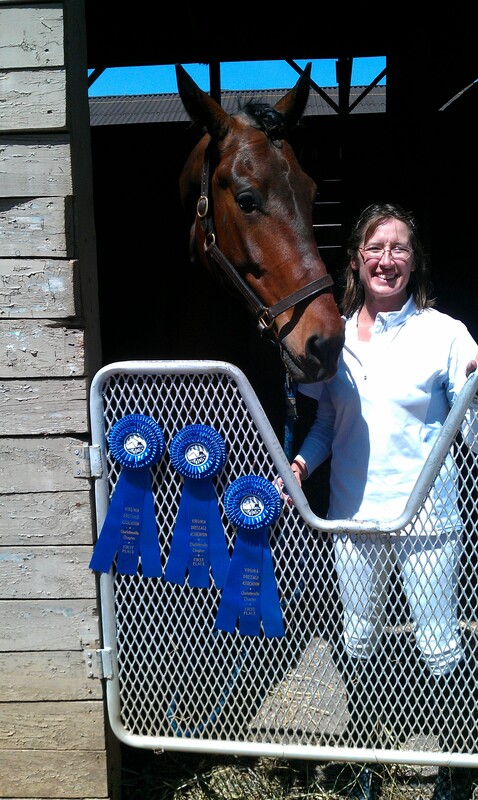 The second test was Intro A – 70.9% and a blue ribbon (*). The judge Kem Barbosa (S) commented that “you can move up!” But we just started! I’ll take the comment that we are on the right track with our training. The only hiccup came when we were ready to go home. Everything but Ike was loaded and he decided that he was NOT getting on the trailer. My friend suggested that perhaps he was enjoying himself and wasn’t ready to go. My husband and I were ready – tired and very hungry. After 25 minutes of waiting, Ike hopped on. Ike and I met our goals for the show. We had fun, stayed in the ring, and I remembered to breathe. My compliments to the Charlottesville Chapter of the Virginia Dressage Association. This was a well run, low key show that was a perfect setting for a successful day. Can’t wait to see what the rest of the summer holds. I had decided that the saddle needed to be checked based on the underside of the saddle pad. It appeared as though there was a bit of excess pressure around Ike’s withers. He has grown a couple of inches taller and there is a hint of muscle on his topline these days, so the thinking was that the tree might need to be adjusted or that the saddle was too narrow and I’d have to say goodbye to the current model and hunt for a new one. 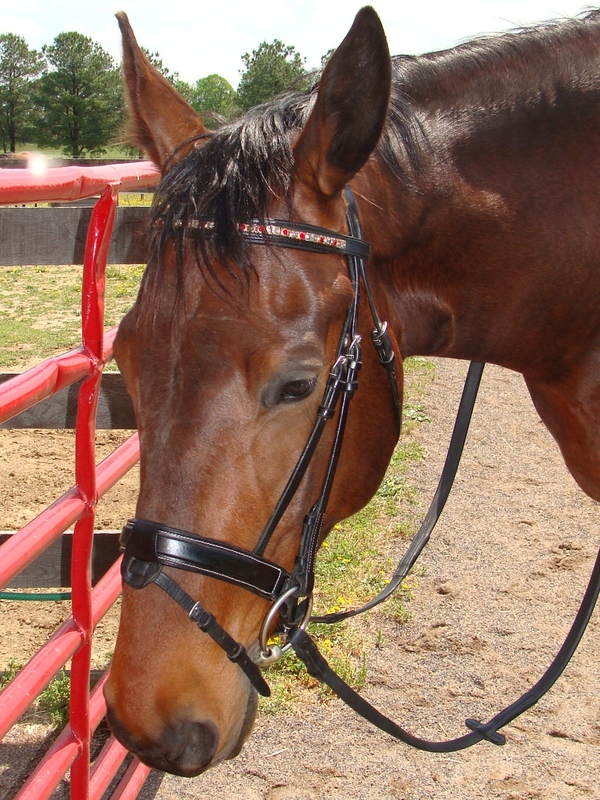 I currently ride in a buffalo leather, Custom Saddlery Advantage saddle (http://mysaddle.com/Advantage.html) that was constructed for my Thoroughbred. I LOVE my saddle. Yes, love. It puts me in the perfect position. The thought of saying goodbye gave me an oogy feeling in my stomach. If you’ve ever ridden in the perfect saddle, you know what I mean. The saddle fitter arrived and it turns out that we know each other from the local dressage club – small horse world. She had lovely things to say about Ike and, drumroll please, said that my saddle was still perfectly serviceable for Ike!! Hallelujah! [My friend A will be very sad at this news, but my pocketbook was quite pleased.] After watching me ride, she realized that it did need some flocking towards the front of the saddle. Watching a saddle fitter work is fascinating. With all the modern technology available, it is still done by hand and by feel. It is like watching an artist at work. Once the wool flocking was added, I hopped back on for my lesson. The saddle fitter stayed to watch, and thank god she did. Ike was not happy with the adjustments. I could not keep him straight and between the reins; it was like riding a writhing earthworm…not a good thing two days before a show. Ike fell in, he fell out, he swayed like a flag in the wind. Ugh. We stopped, and hemmed and hawed, and Ms. A took the saddle to remove some of the flocking. 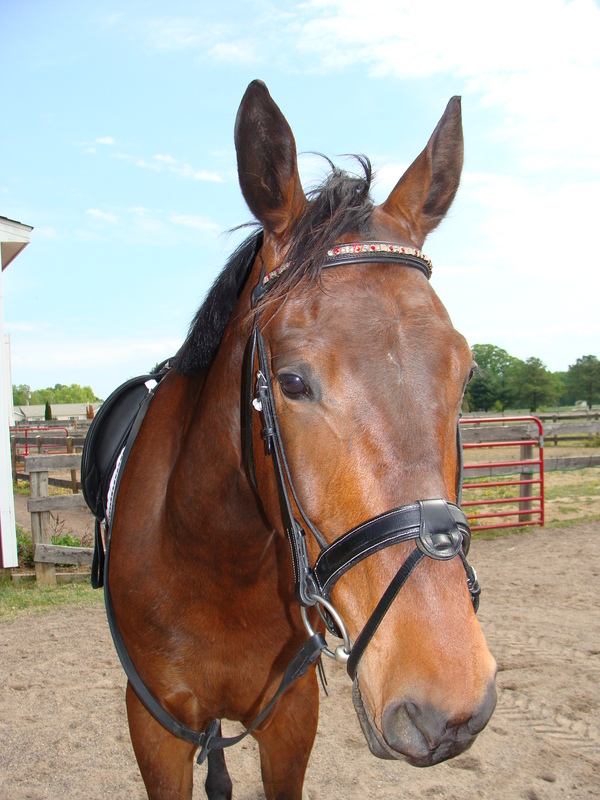 We popped another saddle on Ike and there was almost immediate improvement. We then put my saddle back on, sans two fist fulls of flocking. It was a night and day difference. I would not have believed it unless I had seen and felt it for myself. The old adage is no hoof, no horse. I say bad saddle fit, bad ride, bad horse. We ended on a positive note. His canter was lovely today once the saddle fit was as he liked it. Ride times were revised, but I’m still the first down centerline. Thank goodness that I won’t be riding an earthworm. Back in the saddle again. After three days out of the saddle, it was nice to slip my boots into the stirrups. 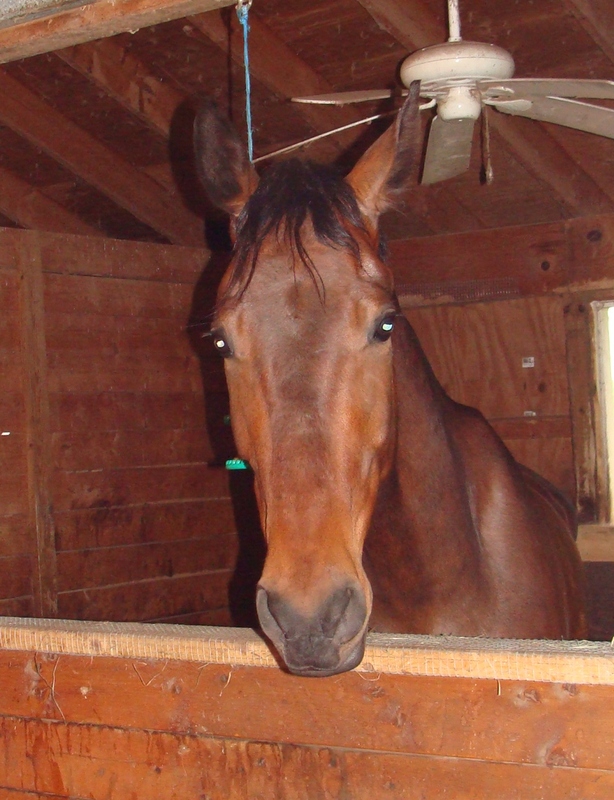 The image above is how I found Ike when I arrived at the barn. 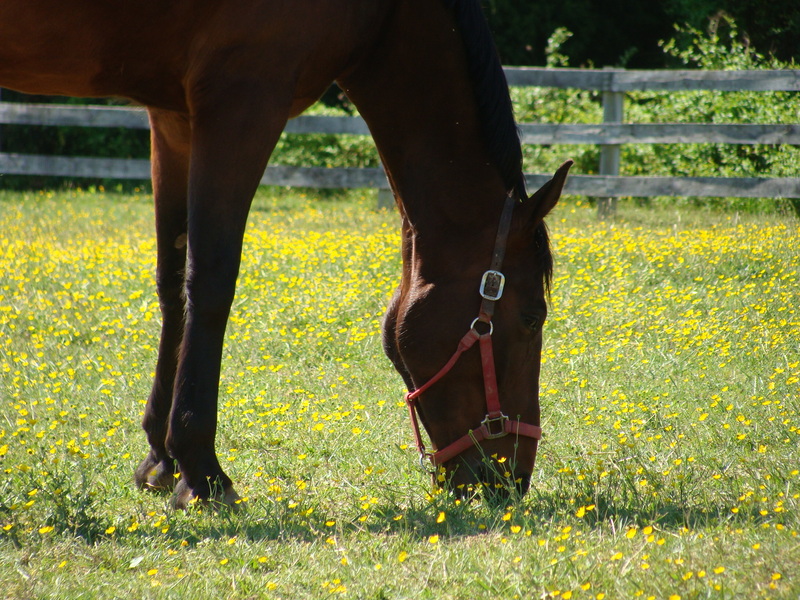 He was contentedly eating the grass renewed by the recent rain even without his beloved Lady in the paddock next to him. He usually has a meltdown without her, so this was a big step for him. Today’s ride albeit short was productive. No crankiness during warmup today – makes me wonder if it is the saddle or just a coming 4-year-old testing Mom’s patience. Could be a bit of both. In any case, warmup went smoothly and we drilled some turns onto and off of centerline – a really smushed figure eight. I checked my straightness near my turns and detected a bit of drift – the kind where you would get the comment, ” fell right” when you were turning left. Some of that is me with my non-focusing eyes, some is Ike since the hind end is still sometimes in its own separate orbit from the rest of his body. Ms. C and I have decided that it is better than it was, but we still have some work to do. Practiced our trot circles followed by our canter circles. Ike did fine at the far end of the arena. We then moved to the end of the arena with the gate through which his friend Lady had just exited…well, let’s just say that the solar system expanded at that end. I’m circling left and I swear the hind end was going to catch up to the front end as it swung out further and further. Not a chance in you-know-what that we could get the correct lead, let alone even consider cantering. Sunday will be interesting since the canter circles start at A – yes, A, where there is a big, gaping hole through which to escape. All we can do is try our best. Our farrier arrived a short time later and gave Ike his pre-show pedicure. We opted for the au naturale hoof. I just don’t think that dressage judges would be all that impressed with red glittery hooves. I don’t think I would be either. I’m ignoring the weekend weather forecast for now. Fingers crossed that the weather gods are kind to us. Three more days to prepare and still much to be done: lesson, saddle fitting, boot shining, trailer loading, bathing (weather permitting), a bit more mane taming, braiding, tack cleaning, mental test riding (there is an app for your phone with the dressage tests, but I’ve not broken down to pay for it yet), and 10 other things that I know I’m forgetting. Why does the list seem to keep growing?? 4 days to go to show day. And another day that I did not get to ride. Have to work to pay the bills, but Ike did get back to work today and actually spent most of the day outdoors. Ms. C put him through his paces and he was tired when he was done. “Can I have a nap now?” I like having her ride him so that she can better guide us along our way. Her aids are never two seconds late like mine. She also better understands the subtleties of getting him to unlock his jaw and properly flex. I am but a mere novice when teaching a horse a concept like flexion. I swear some days unlocking his jaw is like getting concrete to bend. He is starting to better understand the idea and be more responsive to the request at home. It will be interesting to see how much of his training is retained in the show environment. And speaking of the dressage show, ride times are posted! I am the first ride down centerline on Sunday. We will draw the line in the sand for others to follow. Should we focus on straightness or go for a slanted or wavy line just to mess with the next riders? Yeah, yeah, I will focus on straightness and promise to focus to prevent the drift off centerline. And breathing, yes, breathing. I know I keep posting about breathing, but it really is an important component of a successful ride. It is my mantra for the next few days; I’ve also been practicing yoga on the non-riding days which also helps me with proper breathing. The farrier comes tomorrow to get Ike’s hooves in tiptop shape. If all goes well, I might actually get to ride as well. Fingers are crossed for nice weather. Yes, I know it is April, but it sure did not feel like the end of April today. When I arrived at the barn at 3:30, it was 49 degrees, when I left 40 minutes later, it was 43 degrees and steadily raining. Yet again, Ike decided to spend the day indoors. The photo above is a picture of the face that greeted me, “Hi Mom, guess what I stayed inside today! May I have more hay please?” Sigh, how is it that a horse that is so young and so big can be so content in a 12×12 stall. At least when he stays indoors, he cannot get muddy. No complaints there. It is nerve racking and exciting to be heading down centerline again. I haven’t entered at A since September 2010. Please let me remember to turn the right way at C. Please let Ike stay in the ring. Breath in, breath out (this one is for you SIL). Here’s hoping for sunny weather and a dry arena tomorrow. So today it is raining, and raining, and raining some more. No complaints since my flower beds desperately needed the water as did the paddocks and riding arena. The ground was looking more like late June, early July hard packed ground rather than April. It was not hard to guess where the Fair Weather Fairy was when I arrived at the barn….in his stall happily munching hay. He lasted outside for maybe 30 minutes (if you round up generously) and then said, “Bring me in before I melt!” No nickering, but I can tell that he was happy to see me. We spent some quality time together while I groomed. His winter coat has mostly shed out and his summer coat is rather lustrous and shiny. Ike’s tail has grown about 4 inches since he moved to Virginia and all the weekly conditioning has it looking full. His topline is finally starting to fill out and muscle up. No wonder the saddle is getting tight at his withers. It is peaceful time when it is just the two of us in the barn. I share my secrets and he listens patiently and without judgment. 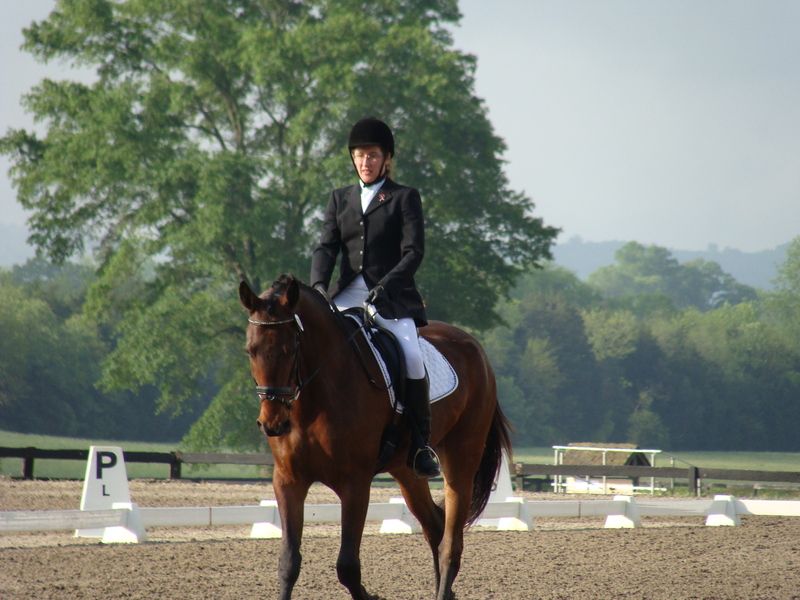 We talked about next Sunday’s dressage show and reviewed the test movements. I promised Ike that I would stay relaxed and breathe. My sister-in-law suggested that it also be one of my goals for the show. Yes, breathing would be a good thing. Ike promised to try his hardest to listen to me. One week to go and still much to be done. The farrier and saddle fitter are scheduled. Going to try to get in two lessons if time and weather permit. Thank goodness the show pants fit, but if I can be honest, I hate the fact that they are white. Mark my words, there will be something on them as I head down centerline for the first time – coffee, manure, green slobber, dirt or a combination that will probably not come out. That’s OK with me though, it will just be thrilling to be headed down centerline after a long hiatus. Today I remember why you must be careful around hotwire. We have hotwire strung over Ike’s new gate to keep him from crashing into the gate; just can’t afford to continually replace gates when we need to save for a bigger saddle. I got just a wee bit too careless and let the hotwire sag down and touch the gate just as I pushed the gate open with my elbow. POW! Electric shock ran up my arm and made my fingers tingle and the hair on my arm stand up. No wonder the horses avoid it. Note to self, do not let wire touch the metal gate. I repeat, do not let the wire touch the metal gate. Luckily that was the only shocking news of the day. Ike is such a good boy. I cannot get over how lucky I am that the planets aligned at the right time for me to have such a amicable partner. 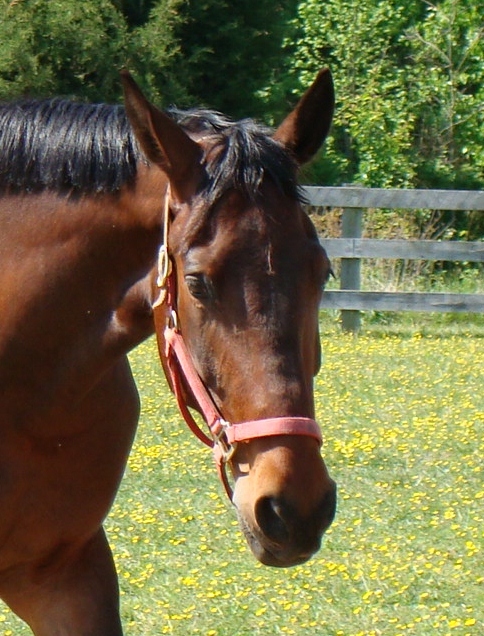 He worked well with other horses in the ring and stayed focused when they left him as he continued to work. Now if he can only be as sane and low-key when we make our debut in public. I’ve determined my goals for next Sunday: Stay safe in warmup and stay on Ike’s back (it is an awfully far way to fall), Make it into the ring and past the judge’s booth, and Finish the tests with no extraneous movements. Not lofty goals, but I’m really just hoping for a successful, positive outing. We have many years ahead of us and many more shows to set higher expectations. Trying to decide how to braid the giraffe’s mane. Fewer, larger braids or smaller but more numerous ones? Is there a better choice? Feel free to chime in if you have any thoughts. I’m leaning towards fewer braids because it is a task I do not enjoy.